Highlander Connor MacLeod Forged Katana Sword | BUDK.com - Knives & Swords At The Lowest Prices! Officially licensed authentic replica of Connor MacLeod's katana. This iconic sword is for the first time being made with a real heat-forged, 1045 carbon steel blade and authentically detailed faux ivory handle. The United Cutlery replica has been meticulously crafted using actual prop reference materials. The handle grip is cast one-piece hardened resin, to precisely match the look, feel, and weight of real aged ivory. 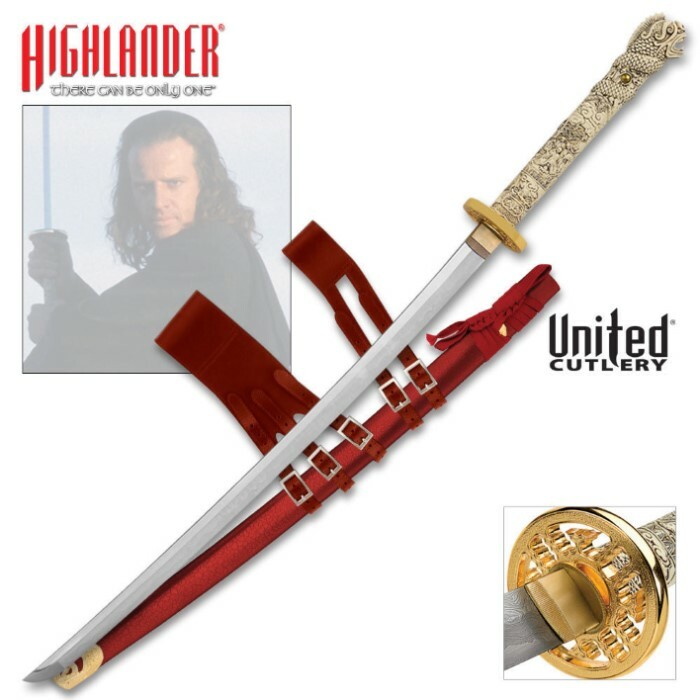 This version features the correct; 24K gold plated extra thick stuba, authentic metal tang caps, improved sculptural details, and authentic red scabbard with genuine red leather sword hangar to match the one worn by Ramirez in Highlander 1. 28" blade, 40 1/4" overall. United Cutlery, UC2593.